You are here: Home Media News Welcoming Cyrus Too! Mr Cyrus Too has joined the Biosciences eastern and central Africa-International Livestock Research Institute (BecA-ILRI) Hub as the Greenhouse Supervisor. Cyrus joins us from the floriculture industry where he worked in various capacities as a propagation officer, production officer and a tissue culture production manager. 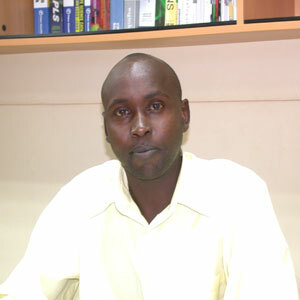 He holds a BSc in Horticulture from Egerton University. He has gained a wealth of experience in greenhouse management and use. This includes greenhouse production of plants and the related issues of climate control, crop protection, crop nutrition and greenhouse equipment maintenance. Cyrus has worked on establishing a highly effective biological control strategy in controlling red spider mites using Pytoseiulus persimilis (a pest attacking mites) in rose production under the Research and Development department of Sian Roses. He has also served as a tissue culture production manager in the private sector. He led training and production efforts including media preparation, initiation, multiplication, in vitro rooting and acclimatization of plants such as calla lilies, bananas, and roses. He also conducted virus screening and eradication using meristem tissue culture and the Direct Antibody Sandwich- Enzyme Linked Immunosorbent Assay (DAS-ELISA). Cyrus has a passion for bees. He is intrigued with the complex dynamics involved in the highly efficient functioning of bee hives: the queen bee with her population to serve her, and the worker bees pollinating and improving the environment. He is also an enthusiastic lawn tennis player. Please join me in welcoming Cyrus to the BecA and ILRI family.